fleet street fox: This Fox is f*cked. IF A chum from another newspaper asked for access to my newsroom, to know my whereabouts at all times, and sit in on all my interviews I'd say no. The only reason they'd want to do so would be not because they like me, which I hope they do, but to nick a story, and aside from the ethics it's more than my job's worth. It's the same in most walks of life, because the only possible reason someone who's not supposed to be there wants to be there is to get something out of it for themselves. But if you're the Secretary of State for Defence in Her Majesty's Government, apparently it's fine to take your best mate, who is not security-vetted, into secret meetings with a US general, foreign statesmen, diplomats and business people. It is perfectly all right even though the best mate was not there in any official capacity and merely had "inappropriate" access to the official diary in the same manner as a spouse and used it to be in Singapore, Bahrain, Abu Dhabi, Dubai, Hong Kong, Israel, New Zealand, Australia, Qatar, Florida, Washington and Sri Lanka at the same times. It is even all right to big up a businessman who is apparently so bad at business he made only £20,000 in the past four years even though he is director of three companies, one of which is dormant, and there's no clear source of income with which the mate would have managed to jet around the world quite so much. It is completely OK because, we are told, no business deals were struck as a result of these meetings, even though no-one can think of any other reason the mate might want to be there unless he was acting as either a guide dog or a carer. 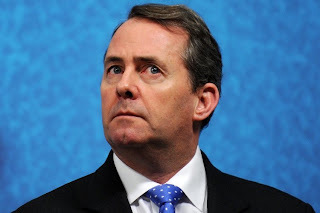 All Dr-of-taking-the-piss Liam Fox needs to do is say sorry, get his chums to say the best mate was in fact "a groupie", and most of his party bray support because they share his politics rather than genuinely believe he's any good at his job, most of which so far seems to have involved leaking against Dishface and buggering up the Armed Forces. There are two inquiries underway but what no-one questions is the fact that the man in charge of the nation's defences is apparently so soft in the head he seriously expects us to believe any of his codswallop, or worse that he may even believe it himself. Someone who is stupid enough to have either done all those things or expect us not to notice the stink of corruption with which it all reeks shouldn't be allowed near metal cutlery, much less tanks and submarines. So, in words simple enough even he can understand them: we all know your mate was in it for his own ends. You helped him. You are either very stupid or very dodgy but either way we don't want you running the Ministry of Defence, thanks all the same. If anyone who worked for you had done what you did they'd be court-martialled, and so should you be. You're probably going to hang on and drag the scandal out until someone finds a financial link, blaming smear campaigns and nasty journalists and whatever else the voices in your head tell you to say, while wearing your underpants on your head and sticking pencils up your nose. But I'm afraid there's only one person to blame in all of this. And that's whoever let you out of hospital. "Can you hear them? I can hear them. They wear tiny little shoes."